Join me for a unique and unforgettable experience in the heart of the southern province of Ragusa, Sicily! I invite you to unwind, take a breath and connect to your physical, mental and emotional bodies as you return to your natural state of harmony and beauty. Pastures, fields & walking paths surround the retreat property in Sicily. Fresh air and tranquility are in abundance. A nearby beach town offers shops, restaurants, beach lidos and long sandy stretches of golden sand washed by the waves of the Mediterranean Sea . . . Welcome to Italian paradise! Come all sun chasers and join me for a magical week that combines all of my favorite things: travel (Italy! ), sun, yoga, healthy foods and beaches! It is totally a yogi's paradise! You will eat so healthy you'll feel nourished for all of the yoga-ing and adventuring we will do. Plus, all of the sleeping we will do under that big bright sky! We’ll visit a winery, go to the beach, take in some food prep classes and have time for optional adventures or simply lounging and reading. The Practice: Your yoga retreat in Sicily will be designed around two daily practices, a morning rejuvenating practice and an evening healing/grounding practice. During the retreat, I will share health and wellness tips along with 2 optional cooking classes. This is a great time for you to push yourself in your yoga practice and to fully integrate a healthy lifestyle. Use this time to reset in a new way! SankalpaSicily is strategically placed in the heart of the southern province of Ragusa. The Baglio, a traditional rural structure built with the local white stone around an internal courtyard, is located in a quiet place in the unique Hyblean Countryside. The province of Ragusa has a rich artistic and cultural heritage. Here you can enjoy and explore the world renowned Sicilian Cuisine, Hospitality and Baroque Architecture, just to name a few. Highlights include Ragusa Ibla’s stunning setting, defined as an island within an island, to Modica, with its magnificent churches, looming domes and a long tradition of chocolate making, to Scicli, a fascinating little town off the beaten track made famous with the series of Inspector Montalbano. In close proximity (8km) you will find Marina di Ragusa, a beach town with shops, restaurants, beach lidos and long sandy stretches of golden sand washed by the waves of the Mediterranean Sea. SankalpaSiciliy offers a wholesome and abundant buffet brunch and an early buffet dinner. Seasonal fruits, dried fruits, tea and herbal infusions will be available throughout the day. Delicious, healthy, simple Sicilian inspired Vegetarian / Vegan / Raw food dishes made with local fresh ingredients and Love will be served. SankalpaSicily strongly believes in local produce, from Farm to Fork and establishes close contact with local farmers and their products. 12-4pm Arrival (light snacks available) and settle into our retreat! There are 10 individual apartments which are pretty straightforward. 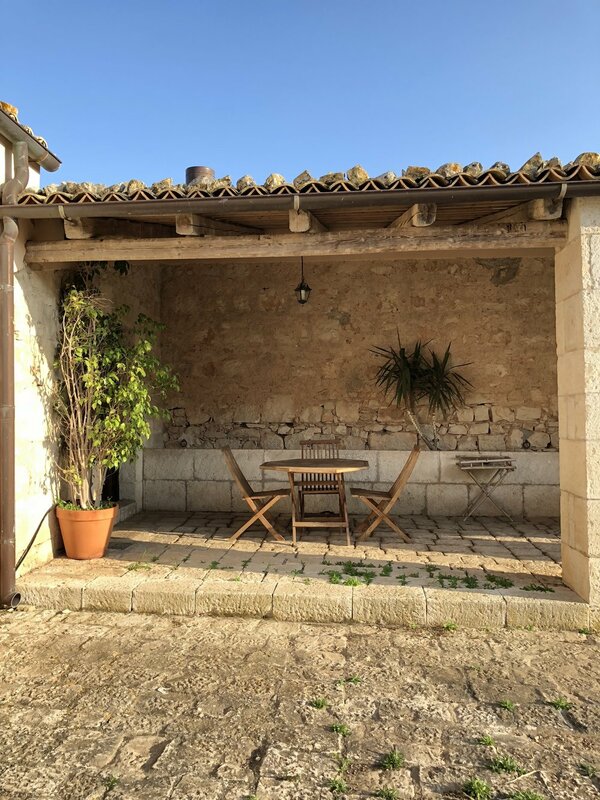 Each apartment offers AC/ Wi-Fi / hot water/ fridge/ kitchenette /crockery and is fully furnished in a setting around an internal courtyard of the Agriturismo. All single beds can be made into double beds. 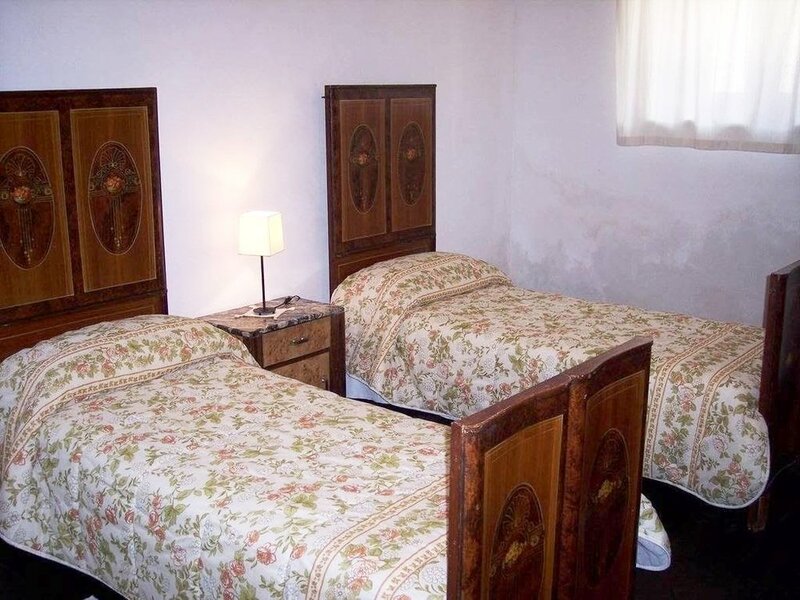 Some rooms have up to four beds. Each apartment dining area is unique. And each apartment looks out into our center area. It is recommended to rent a car, which will be useful during your entire stay for tourist outings. From the states, it is cheaper to fly to Rome than to Naples. From either Rome or Naples or most of Italy, you can fly to Catania and pick your car rental there. You can also fly to Comiso airport, which is nearer to our retreat location, but has less frequent flights. Upon request SankaplaSiciliy can organize airport transfers and a shuttle bus for beach visits or visits to nearby tourist attractions, all at students' expense. There is a bus available almost every hour direct to Ragusa. You can check online on www.etnatrasporti.it From Ragusa there is a bus every hour, which will take you to the junction close to where SankalpaSicily is located. There are buses running from Comiso airport to Ragusa town at the time of research. The amazing island of Sicily has a lot to offer in-between the daily yoga classes, SankalpaSicily will be delighted to help the guests to get a truly Sicilian experience. Upon request we organize airport transfers and a shuttle bus for beach visits or visits to nearby tourist attractions, all at students' expense. *There are yoga props at the space for you to use. But bring anything that doesn't weigh your bag down too much if you need something else. **All participant information must be completed in the retreat registration and waiver below. Please fill it out in its entirety after reading the terms. (a) The price is the exact amount to be received by me in US Dollars. (b) It is also your responsibility to consult a doctor with an understanding of yoga to check that you are sufficiently fit and healthy to undertake yoga classes and other physical activities that you may choose to do while on the retreat. (c) Please advise me of any mental or physical health conditions and dietary requirements before you book. If you have health conditions and dietary requirements (please fill out this form for any dietary restrictions or anything else I need to know about) that may be affected by the activities offered on our retreats I reserve the right to advise you to desist and in the interests of your wellbeing, or others, may decline your participation. Where a booking is made on behalf of several individuals the booking is conditional on the person(s) paying having authorization from all the individuals named on the booking form to enter into this contract. The terms of this contract will apply to each member of the group as though they had paid for their own retreat individually and directly to me. (a) It is your responsibility to ensure that your possessions are kept safe at all times. This includes rental cars or other hired equipment. The retreat package includes SEVEN nights at the SankalpaSicily retreat location, 2 daily yoga practices, 2 cooking demos, excursions for adventuring, one massage, brunch and dinner meals (RAW VEGAN, VEGAN and VEGGIE options only), fresh linens, coffee, tea, herbal teas, wine and the experience of being in a yoga community. Let me know you are interested by filling this out here. Refunds (minus the deposit) up to one month prior to the retreat will be honored if you find a participant to take your place in the retreat or if there is a wait list and your spot can be filled. After April 25th, 2019 no refunds will be made. One of the old cow stables has been transformed into a spacious embracing yoga Shala (80sqm) with 3 windows and an attached bathroom. Because of the original stone floor the floor is covered with a 2 cm thick Tatami. There are also some yoga mats, wooden blocks, straps and meditation cushions. Or use the Buy Now button below to pay your deposit via PayPal. Half of the payment must be made by March 1st and full payment by April 25th, 2019. If you need more time on the entire payment or help with it, just let me know and we can work something out!! Space is limited so reserve your spot! Every meal is a nourishing meal. Our beautiful Piazza where we eat! Looking into our retreat area. Watch the gorgeous sunset every night!